With the launch of a new project by Google, the Museo del Prado becomes the first museum in the world to offer high-resolution images of its masterpieces for access and navigation on the Internet. These images will reveal details invisible to the naked eye of paintings such as Las Meninas and The Three Graces. Thanks to this joint initiative between Google and the Museo del Prado, masterpieces from this Spanish Museum’s collection will be the first to be available for study and appreciation from every corner of the globe through their presence as giga-pixel images. Through its involvement with this project the Prado aims to be a pioneer in the possibilities offered by the new technologies for the dissemination and promotion of the artistic heritage. These spectacular images of its works, which are only available on Google Earth, will allow scholars and art lovers to appreciate from close up the most minute details and motifs represented, the lines and brushstrokes of each artist, the under-drawing, craquelure of the varnish and many other aspects difficult to see at first hand. Google Earth’s unique technology makes it possible to navigate these images, whose approximately 14,000 mega-pixels offer a precision 1,400 times greater than that of a 10 mega-pixel digital camera. In addition, the Prado layer within Google Earth includes a spectacular 3d reproduction of the Museum’s building. The process of obtaining the images began in May and lasted around 3 months. During this time the works were photographed using special equipment, taking all necessary precautions to ensure that the canvases were not damaged. Once the images were obtained (more than 8,200 photographs were taken), Google Earth technology was used to achieve the zoom-in effect. In this way the paintings constitute one more layer within the programme, comparable to its images of streets or houses. “For all of us it has been a great pleasure to work so closely with the greatest picture gallery in Europe and one of the leading institutions of its kind in the world in order to make paintings such as these available to all. The almost microscopic level of detail of the images allows the user to study the various techniques used by the artists, which is not possible with the naked eye alone. The result is a better appreciation and understanding of the work,” notes Laurence Fontinoy, Director of Marketing at Google. All information on this project is available on www.google.es/prado. 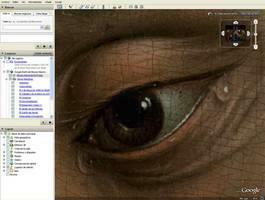 To access the images, activate the 3D layer within Google Earth, click on the Prado building then click on the required painting. Google’s cutting-edge technology puts millions of people around the world in touch with information on a daily basis. The company was founded in 1998 by Larry Page and Sergey Brin, at that date PhD students at Stanford University. These days Google is one of the most important Web presences in all global markets. Its programme of focused publicity offers companies of all sizes demonstrable results, while improving the general experience of Web users. Google is based in Silicon Valley, with offices throughout North and South America, Europe and Asia. For more information, consult www.google.com.